100 decorated tear-out sheets to fold into dragon-themed paper gliders, including fearsome fire-breathers, many-headed monsters, scaly sea serpents, a mechanical dragon and lots more. 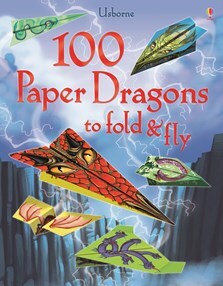 Includes detailed folding instructions for four different types of dragon, from Razorwing to Skyskimmer the glider, in the fold-out front cover of the book. With dragon master challenges to test the dragons’ accuracy, distance and endurance.